It's finally decision time here at The Rubber Cafe. It was a tough decision and we've decided that we couldn't decide. We were originally looking for two design team members and now...well...we picked the three remaining. Let's all welcome Kristine, Maureen, & Sabrina to the design team. We are really looking forward to their wonderful artwork. We're so glad you've checked us out today. Make sure you continue to follow our blog for some exciting projects and upcoming news. Today...Melissa & I are in Valley Forge for a scrapbook convention and looking forward to a great weekend with our customers. Here we have Melissa and our friend Frank. We borrowed him for the weekend and dressed him up. Isn't Frank handsome in his tiara? If you are coming to the show...don't forget to stop by and say hi. Have a great weekend from The Rubber Cafe. Welcome back to the search for a new design team member. This will be the final challenge for our hopeful design team members. 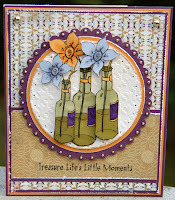 We are so please to be showing off such beautiful cards and a great box. This week we gave the girls a color challenge. Brown, blue & red. They did such a great job...don't you think? Between now and Friday July 30th...we'll make the final call. We'll post the new design team list on Friday...so be sure you check back. Don't forget to comment letting us know who you're voting for. The team also played along with the color challenge. Don't forget to check out other posts this week for a fun look at these great colors. All the ladies enjoy getting your feedback. As you know, we've been having some challenges and new hopefuls with beautiful inspirations. Are you inspired...I know I am. This week is no different. On Wed, 7/28 we'll be sharing our color challenge. I thought I would give you a sneak peek at the colors today. 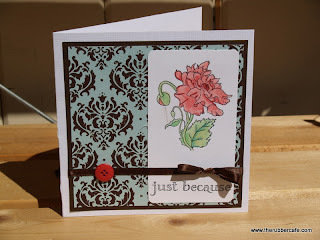 This card uses Blossom Branch and a stamp from Just My Type. When I had originally designed this card...it was green. Not a quiet green either...but a kind of lime green. I don't know what I was thinking. I showed Melissa. Her and I both agreed...it was not worth keeping nor photographing...not at all. I really liked the way the card came together...but I just couldn't get the colors together. Then it hit me...the color challenge...I knew what colors I was going to challenge you all with...but I wasn't using them. It was the perfect combo for this card. Blue with a splash of brown and a hint of red. I loved it. I hope you do too. If so...leave a comment letting us know how we're doing. Speaking of comments...We would like to challenge all of you to sign up for the blog. As soon as we reach 100 followers...something special will happen. I'll give you a little more information about that when we get a little closer. Take care and Happy Stamping. Happy Monday all! I have a green card for you today, featuring the Grater Floral stamp. LOVE this, I get all these nostalgic feelings of Swedish Summer when I see i. My childhood in my granny’s old summer house with a tin of different flowers on the kitchen table. Did I say I love this stamp??? LOL! I did it almost all green. Sorry for bad photo. We’ve had pouring rain for several days with no proper day light. This was the best I could do. I used a Spellbinders nestie both as card base and as layers on the card. The image is colored with copcis and the edges inked with distress ink. I leaved the nestie die on the die cut while inking the edges. It works like a mask and gives a crisp and clean non inked frame. I love that! Here's my take on the fun Sketch Challenge. I paired some new S.E.I. papers I had on hand with the Swirled Butterfly image from The Rubber Cafe. This was colored in with copics and then spica glitter pens to add some pop. I attached this fun ribbon with some eyelets. I love using different types of fibers but when something has a lot of open area like this ribbon it can be hard to attach. The eyelets were perfect since it "grabs" the edges of fabric and hold it nice and tight. Have you made your sketch yet? If so please throw a link to it in the comments so we can check it out! If you have been following along, and we really hope you have, we've been having a challenge here and there to select a new design team member. Sometimes life gets in the way of life...and this week has been no exception. A couple of hopefuls will not be able to continue. We really hope they come back and try again next time. This week I asked them to do a sketch challenge. Some of our design team members have already posted their sketch. Don't forget to check Michelle and Tesa's posts as well. Wow...aren't these beautiful cards. At the end...leave a comment letting us know who you vote for in the search for our new design team members. If you've played along...because we really like it when you play along...leave a link so that we can say...oooo...aaahhhh. Aren't they great. Let's all give them a round of applause...shall we. Next week...it'll be a color challenge...wanna know what color??? Tune in next week to find out. Following next weeks challenge...we'll make the final choices. Oh I hope I win...oh wait...I'm not playing. In any case...come back...it'll be great fun. Hi folks! Hope you had a lovely weekend! I have a easy peasy card to share today. It uses the magnificent Large Highwing Butterfly. I have let this one rest for a while, but I thought it was about to let it fly again. I kept a very clean color scheme – white, blue and black. Love these kind of color schemes, they often end up really elegant and clean and classy. Well, I don’t know about this one, but I do like it! LOL! 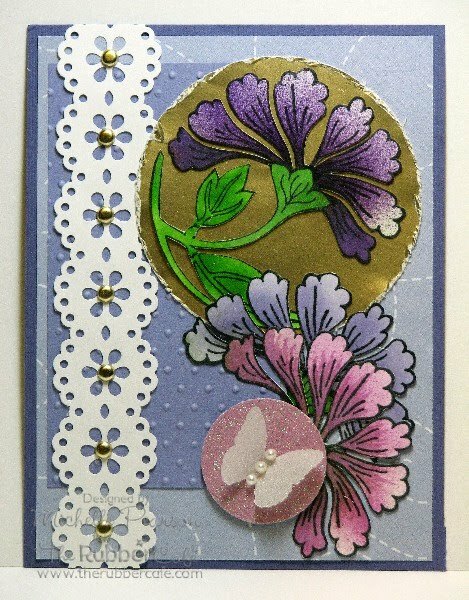 I distressed the edges of the patterned paper with some sandpaper so that the white core would shine through and then I stitched it on a white card base. I use my favorite size, 4x6. What sizes do you usually make???? Have a favorite??? 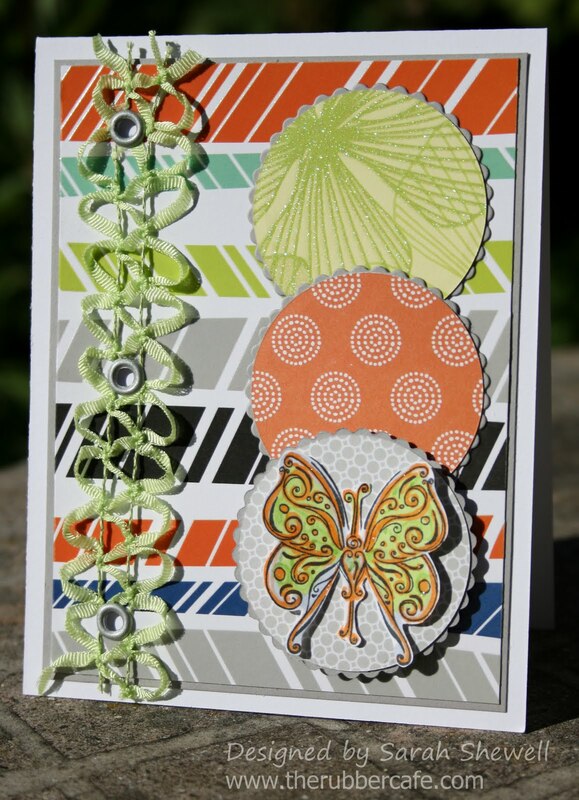 The butterfly is stamped with black dye ink on white smooth cardstock, colored with a copic and cut out. I pimped the flower ribbon with some rhinestones and added a sticker sentiment to finish it off. Done. Easy peasy! Looking forward to see what our DT applicants will do next??? I know I am!!! Here is my take on the sketch that Lisa presented us with. I spent some time in my flowers this weekend...and had them on my mind. I decided to use the Tapestry Flower for the circles on the sketch. I colored my images with the Copic Airbrush. 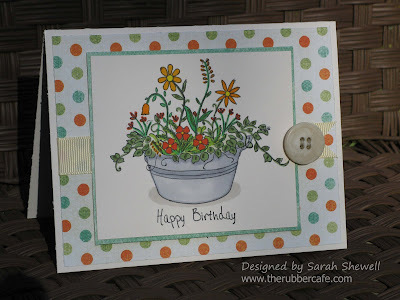 I like fussy-cutting....and had my fun on this one!! I can't wait to see the rest of the takes on this sketch!! Today is my birthday so I'm granting myself permission to break from the norm and make something other than a card. 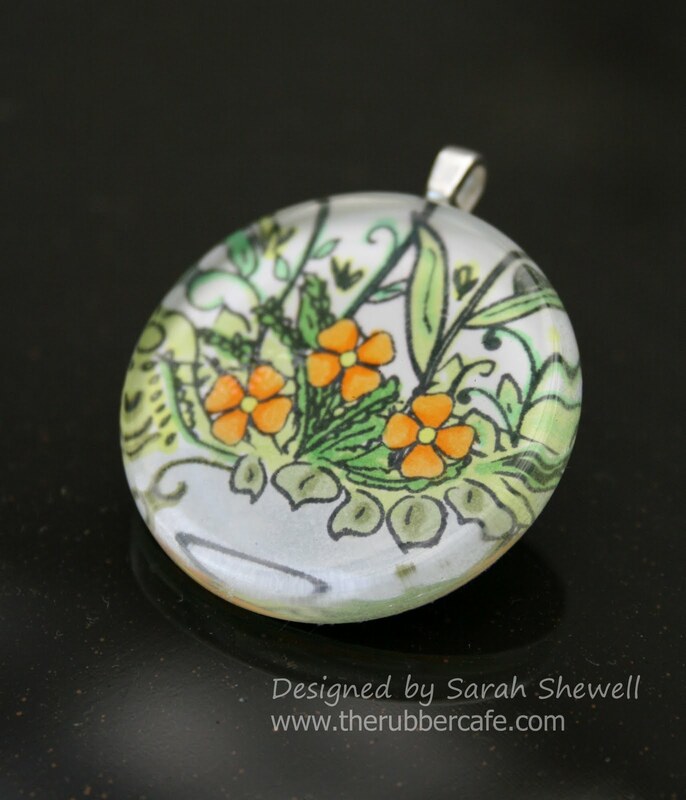 I used the Hand Picked Floral stamp to create a pendant. I colored in the image with copics and then used a punch that matched the size of the glass piece I used to cover it. To attach the paper to the glass I used some Glossy Accents glue. You simply need to place a pea sized drop in the center and then "smoosh" it over the paper so you have even coverage. Once you let that dry for about 30 minutes you can use the same glue to apply a jewelery loop so that it can hang around your neck. So...now that you have a chance to look at all the wonderful choices we've made...don't forget to cast your vote...leave a comment and let us know what you think. 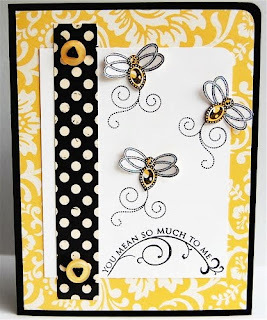 We also encourage you to find a card that inspires you and play along. Don't forget to give the ladies some love and tell us which is your favorite. I can't pick all by myself...I would have to pick them all. Maybe this isn't the job for me after all. We hope you feel inspired and have a great week. Hope you're having a terrific Tuesday. I have been working on several tutorials for your Tuesday pleasure. 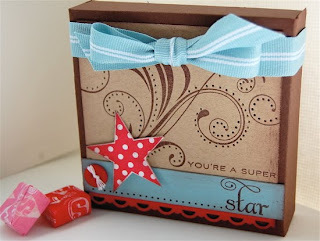 I was going to do a post-it note tutorial today...but a customer at the Georgia show saw the card drawer tutorial on Splitcoast Stampers and wanted a how-to on the Ultimate. So...next week...we'll do the post-note tutorial. If you check out the resource section over at Splitcoast, you'll find some wonderful tutorials. One of the most recent tutorials is this card drawer. The design is very simple. The measurements are slightly different for the Ultimate. * Two sheets of cardstock 9" x 6"
* One sheet of cardstock 9" x 7 1/2"
* Strip of cardstock 6 1/2" x 1"
* Scraps and embellishments to decorate. On the inside of your Ultimate, there is a section for boxes with the base and top of the box using separate score lines. This is the section we'll be using today. 1. Score each sheet of 9"x 6" on the 3rd score line for each section...one on the top and one on the base...on each of the short ends and one of the long sides leaving one side open with no score line. 2. Fold all score lines and cut into your paper horizontally on each score line...just up to the intersecting score lines and add adhesive to the outside of each end flap. Box will be open on one side. It is important to cut into each section from the back because if the flaps are attached on the side and not the back, your drawer will stick going in. 3. Score 9" x 7 1/2" sheet of cardstock on all four sides, also on the 3rd score line using the base. 4. Fold all score lines and cut into each corner horizontally...just up to the first intersecting score lines and add adhesive to each corner flap to close up to form your box. 5. Add One and Only adhesive to the inside of the open box section that was score on box top. 6. Slide open box base into open box lid to form the drawer slot. 7. Use a 1" punch to punch a notch out of the front of the drawer. 8. The 1/2" strip is used to make the drawer handle if you so choose. 9. Add scraps and embellish. Today I used the Calla Lily Collage to the top and added Pearl Jelly Dots to accent the drawer handle. 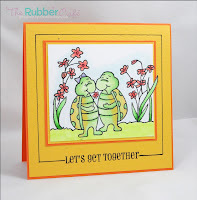 There is a DT search going on and there were so many fantastic card makers out there applying. Next step will be a couple of challenges and I can’t wait to see what the ladies will come up with. I saw the sketch Lisa made for one of the challenges, and simply had to use it. It’s a GREAT one! 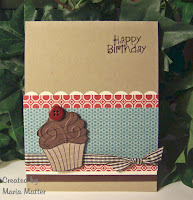 Used it with the Birthdays and Balloons set (soooo much fun with this one), and kept it really simple. I stamped the dog with balloon first, with the oh, so lovely MME paper with clouds taped down with removable tape on the background patterned paper. I then masked it and stamped two more balloons. Tied a twine around the cloudy piece and and then popped it up with some 3D foam for some dimension. 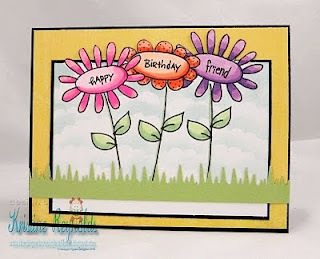 I stamped the balloons on some scrap paper, (soft pink, love it against the teal!) and cut out and popped them too on 3d dots. The dog is stamped and colored and cut out and adhered with…. yep, you guessed it, 3D foam. I love me some dimension… LOL! It’s really clean and simple, but with this adorable dog, I think it’s all it needs. Today I'm featuring one of my favorite stamps from The Rubber Cafe. 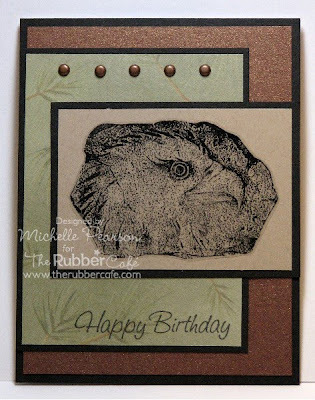 I really love the eagle petroglyph image....he's just a beauty! Masculine cards are often a challenge, so this week I decided to go masculine. 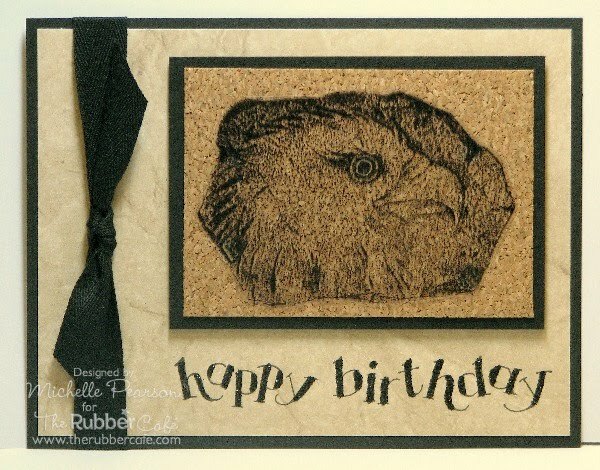 I love to add texture, so though he should be carved into stone....for this project he's showcased on cork since it's easier to mail!! To get a nice crisp and clean image, I stamped the image in Stazon ink onto acetate. I cut the image out leaving a narrow border and applied it to my thin sheet of cork with carefully placed glue dots. This panel is then popped up on a piece of designer paper that resembles stone. Happy Birthday Outline is stamped and then filled in with black glitter. Eagles have glittery eyes, so I brought that in with the glittery sentiment. I finished the card off with black twill. 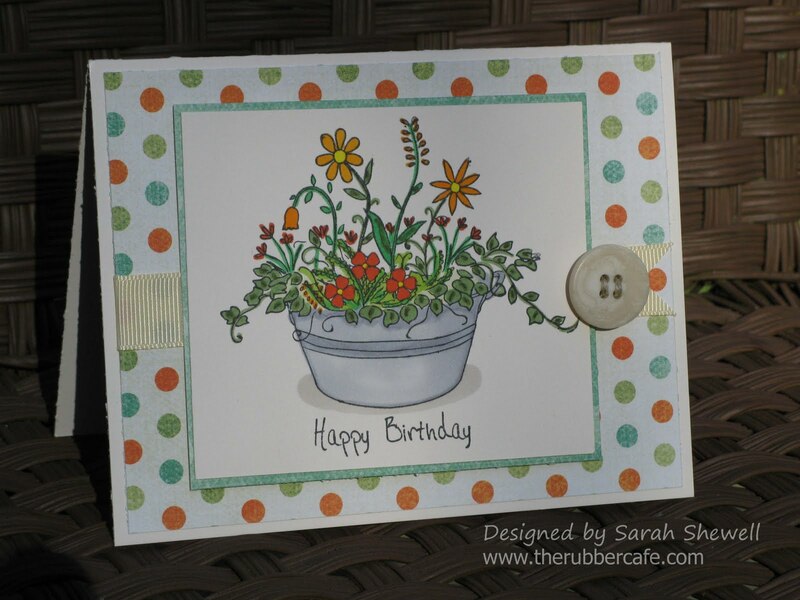 I made up a few of these cards using the Hand Picked Floral image from The Rubber Cafe. I often give pots of flowers to friends and family as gifts, I aim to make them look as full as this beautiful image. It's going to be great to have on hand to give with the bowl of flowers. While this is a very simple card, I'm not gonna lie...it takes some time. The image is detailed and takes me about 20-35 minutes to color in (at a slow pace). I don't usually make cards that take more than 20 minutes total so this is a little unusual for me. One thing I do to speed up the process is stamp several and just sit and color them when I don't feel like creating. The simple act of coloring the image will relax me and make me feel accomplished. I then have a stack at the ready when I need to whip up a card. Next time you feel overwhelmed by the process of having to design a card or project, take a moment and just color. Even if you don't know what you'll use it for I promise you'll feel like you've created and at the very least you'll have an image ready to use when you need something fast. Did you ever feel like you wanted to just send a smile? 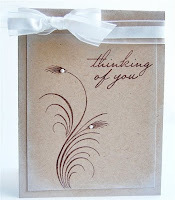 If somebody is a little down...did you just want to send them a little note to tell them you're thinking of them. That's what this week is for me...letting people know they're important...just because. I'm sharing this simple sketch that was a cinch to make. This is the Large Paisley Butterfly from The Rubber Cafe. The sentiment, Just Because, is a simple note to let somebody know you care...just because. 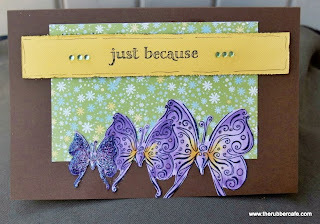 This beautiful butterfly was stamped with Memento ink and colored with Copics. I actually used 5 different colors because I couldn't decide if I was going blue or green...in the end...I did both. BG10, BG15, BG49, YG11, and B24 were the colors used today. I added a little green in the background and a little blue for the ribbon. 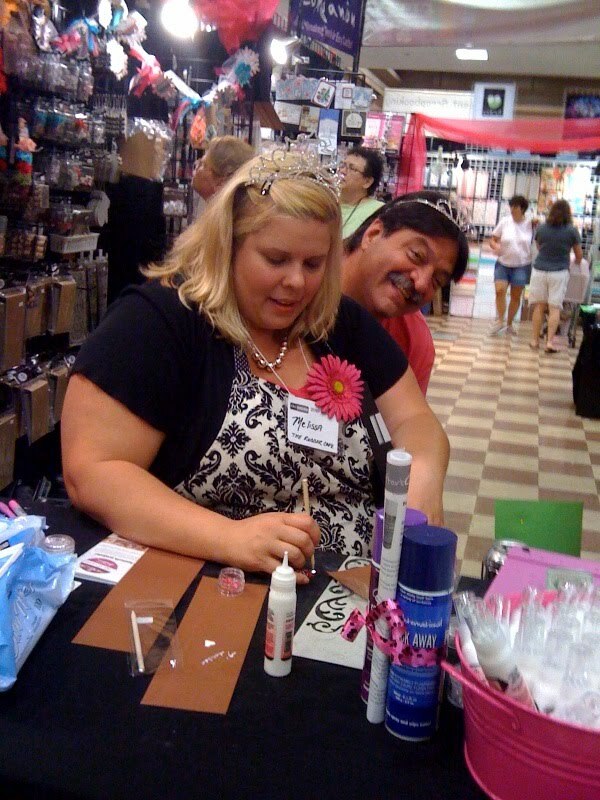 I thought glitter finished off the butterfly nicely and really made him pop. What do you think? Thanks for stopping by and letting me share with all of you. Don't forget to send a smile and let somebody know you care...just because. Hope you all had a great 4th of July! 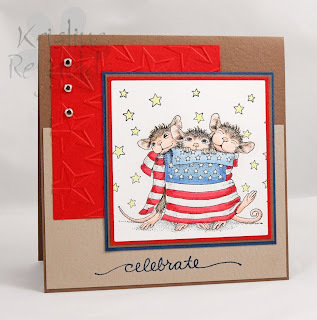 Hope you enjoyed our week filled with red, white and blue cards! I have a photo vintage card today. I saw this really great sketch over at 365 cards yesterday and it simply shouted out – use a photo and that cute It’s a dog’s life stamp!!! So I did. LOL! Have a great new week, and see you again next Monday! 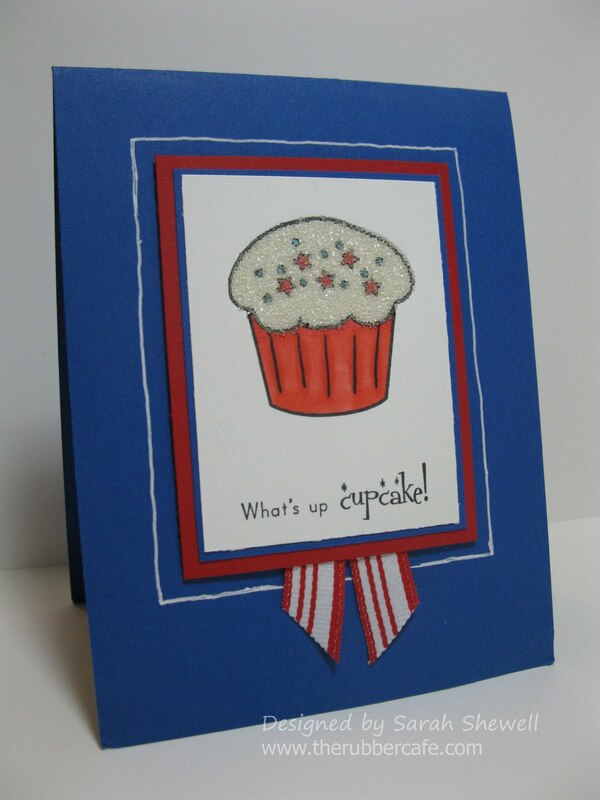 I used the starts and dots topper that comes with the Hey Cupcake set. 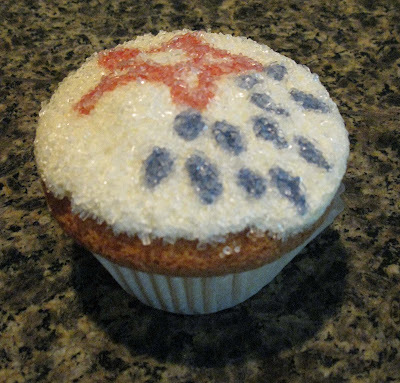 I stamped the image and colored in with copics but wanted to mimic the sugar crystals on my real cupcake. I stamped the frosting image on a sheet of super sticky adhesive. I then cut out the frosting for a perfect match and added some clear glass micro beads. The final touch that is hard to see in my photos was adding touches of glitter. The fine glitter fills in the space between the beads and adds amazing sparkle. The last thing to do was mount it on some layers and hand draw a little box with a white gel pen. Happy 4th of July to all those celebrating!